I am so happy with today's Stacking the Shelves! I only bought three books and already read two of them (5 stars to Wayfarer and Frostblood!). Then I got one of my most anticipated books of 2017, The Names They Gave Us by Emery Lord, in the mail. 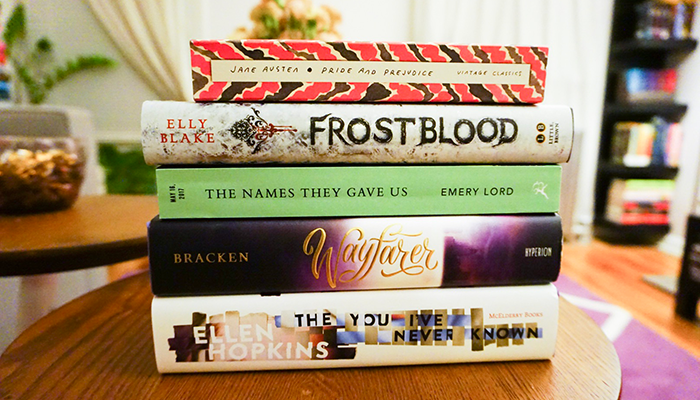 But there are some e-ARCs I mention below that I'm super excited about too. I'm super excited about The Names They Gave Us, because I'm always in the mood for an Emery Lord read ;) And I'm eager to read Frostblood, seeing as how you loved it so much! I'm reading Frostblood now and I'm really enjoying it! It's a bit cliche at times, but the powers are awesome!